Coed, independent, PK3-12th grade school in St. Petersburg, Florida. In 2014, a group of 25 freshmen started a Guardian ad Litem Service Club at Shorecrest. We met twice a month for the whole school year. The goal of the club was to learn about what Guardians ad Litem do and why they are needed, teach others about the Guardian ad Litem Program and do some fundraising. We had a pretty successful year. As part of learning more about the program, we spent one morning at the juvenile justice center in Clearwater. After hearing several domestic violence cases, a few juvenile criminal cases, and lots of child abuse cases, we met with the judge to talk about what we we had seen and heard. Later we met with the Director of the 6th Circuit Guardian ad Litem program and several Child's Best Interest attorneys. It was easy to tell that every club member who attended was truly moved by everything they had seen. We witnessed young teens being taken away from their families and it helped us appreciate the lives we have today. In order to help recruit new volunteers to the Guardian ad Litem program, several of us went to the Saturday Morning Market in downtown St. Petersburg and talked to people about what Guardians do and how desperately our area needs them. We got about 50 people to complete a form requesting more information on the two Saturdays we were at the Market. We are hopeful that some of them complete the training and start advocating for children in foster care! We met our fundraising goals by running a dodgeball tournament for Middle School and Upper School students one Friday night last spring. Everyone who attended had a great time and we raised almost $1,000. Now in its second year, the club is still going strong. We have invited Ashley Rhodes-Courter to be a guest speaker on November 30. 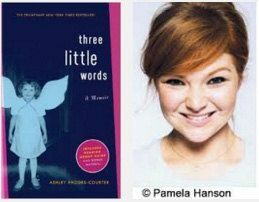 Ms. Rhodes-Courter is the author of “Three Little Words” and “Three More Words”, both on The New York Times best sellers list. She’s speaking to the Upper School student body at a morning assembly and then having lunch with club members. That night, she’s speaking again and the whole community is invited to attend. More than 300 spaces have already been reserved for this free community event. Ms. Rhodes-Courter was in foster care herself, and since then has had an incredibly successful life. Coming to see our guest speaker would be a once in a lifetime opportunity! For many in attendance it will be a new, insider's perspective on our foster care system and how it works. We highly recommend coming to see Ms. Rhodes-Courter in the Janet Root Theatre on November 30 at 7pm! Please RSVP here. Shorecrest Preparatory School is a private, non-sectarian, coeducational, college preparatory day school for students preschool through high school, located in St. Petersburg, Florida.